It sounds simple, right? But, ahh, if you're not used to taking care of your hair it is definitely something that should be on your list. Don't worry though. I can break down this resolution into three simple steps. And look at that, they're all c's. Getting a regular haircut is probably the biggest component to having healthy hair. Trimming off the dead and split ends not only keeps your hair looking better, but it will also keep your hair from breaking off and thus allow it grow longer. 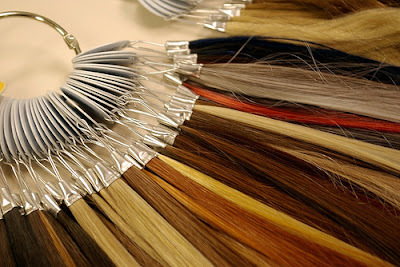 It's no secret that bleaching your hair over and over again can leave it dry and brittle, making it more prone to break. It's not impossible to have perfectly heathy hair when it is bleached out every four weeks, but it's a lot harder. So this year, try a different look. Maybe a honey blonde, or something more dramatic like a chestnut brown. I've already talked about the importance of a deep conditioner, but it's possible that you need a reminder, because I know I do sometimes. Deep conditioners are important. They replace the moisture in your hair that you have lost through blowdrying, flat ironing and all those other kinds of ironing. Besides healthier hair, what are your beauty New Year's Resolutions? Tell me in the comments below!